Warning: You may blow a speaker. Do you prefer your vocal runs long, luxurious, and loud? And would you also like to double that order? Done and done! 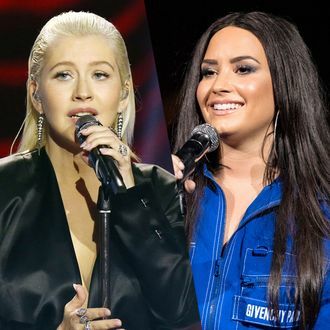 Today, in a living corrective to that “She Doesn’t Have the Range” meme, Christina Aguilera and Demi Lovato have risked life and limb — that is, bursting vocal cords and popping neck veins — to bring you their new powerhouse duet “Fall in Line.” It’s a letter to young women with instructions for toppling the patriarchy sung in all-caps. You could listen to their respective verses sharing personal experiences of misogyny, or you could skip to 2:35 and hear them catch the holy spirit of Mariah and Whitney’s “When You Believe” in a battle of the belters. Car doors will rattle, speakers might blow, and we’re gonna have to add a few more octaves to the list in the wake of their earthquake because when have Xtina and Demi ever used their indoor voices to empower the masses?